Discussion in 'Tarantula Pictures' started by Schlyne, Jan 18, 2005. I feel privileged that Speedracer let me take this photo and several others. Of course it was then startled when I put the lid back on. ;P Out of all the pictures I took, I feel this one conveys the subtle green the most. i got 11 of them. 3 sub adults, 2 females 1 male. 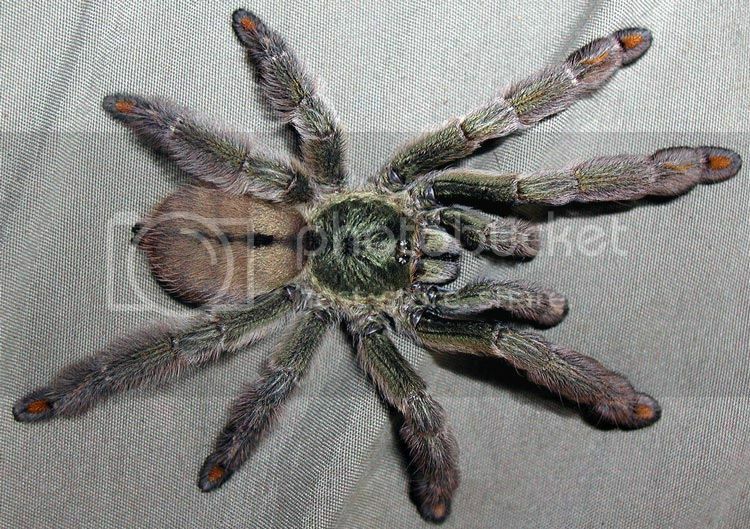 well since people are putting there pics up here is my little one..right after a molt on jan 1 it is now about 1.25"
I love my P. cambridgei, I want to build a display cage for her soon. Same specimen as posted above eluding me once more... hiding in the hole at the end of the brick... never caught the bugger! I love this spid; she's speedy but it takes a lot to spook her, she's generally very calm and not very aggressive at all. looks great! Looks very shy. Pretty T, Can't wait till mine gets that size. very nice, i love mine as well! GREAT SP.!!!! Very nice Ts, and pics. What a great T that is one that is one on list to get.